Blasphemy is a twenty-first century tragedy containing all the elements of a timeless classic. 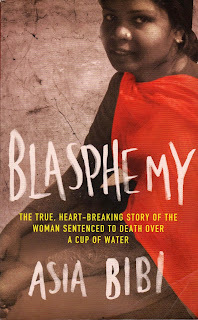 This powerful narrative is “the voice” of an illiterate Pakistani Christian woman, Asia Bibi, recorded (in the first person by Anne-Isabelle Tollet, a French woman journalist, who is “the pen”. The latter spent three years, 2008 – 2011, in Pakistan listening bit-by-bit to Asia’s story through an intermediary, without ever having the chance to meet the brave and innocent heroine of this on-goingsaga. The chain of events which sealed the fate of this mother of five, and sent ripples of anger, disbelief and sympathy across the religious, diplomatic and humanitarian world, started with a simple argument: should a Christian woman be allowed to drink water from a “Muslim” well. The geographical context was a small village, Ittan Wali, in Sheikhupura District of the Punjab (Pakistan) where Asia Bibi, along with other village women, had been hand-picking falsa-berries in the scorching heat of 45 degrees Centigrade. The date was 14 June 2009. Aroused by the claims of a Muslim woman, that Asia Bibi had insulted Prophet Muhammad while defending her right to drink water from the source from which all other women were drinking, the local imam had gathered a mob of enthusiasts the next day, who first physically beat Asia and then turned her over to the police. Since then no appeal for the revision of the case, no plea for mercy, neither any political intervention nor any prayer, even of the Pope Benedict XVI himself has been able to change the fate of Asia Bibi. However, two of the most prominent politicians, both belonging to the then ruling Pakistan People’s Party (PPP), have been assassinated publicly for having shown their sympathies for her. Salman Taseer, the governor of the Punjab, the largest and the richest province of Pakistan, visited Asia and helped her address a press conference, as a result of which he was assassinated on 4 January 2011 by his very own body guard. Salman Taseer knew only too well about being imprisoned as he himself had experienced the prison treatment under the rule of General Muhammad Zia-ul-Haq. The second high profile figure to pay for his life was Shahbaz Bhatti, the Minister for minorities and the only Christian Minister in the federal government. He visited Asia in the prision and gave her hope by promising to try his best to acquire presidential pardon, from Asif Ali Zardari. The pardon could not be granted as the legal complexities of the system dictate that the case first has to go all the way to the supreme court of Pakistan, and a verdict handed, before the president can intervene. This long winded process could take years but, for his intentions and the actions of siding with Asia Bibi, Shahbaz Bhatti did not have to wait that long. On 2nd March 2011 he was brutally gunned down in the capital city, Islamabad, on his was way to his office. His funeral mass was held in the Church of Our Lady of Fatima, in Islamabad. Asia Bibi’s husband, Ashiq Masih attended the funeral disguised as a choir member. This is the chronicle of madness that prowls the land in the guise of sacred law and religious devotion, two of the highest institutions in civilized human society. The mockery and ridicule in addition to absolute disgust such behavior brings to the nation is absolutely lost on stick wielding, slogan shouting enthusiasts. The story, though tragic in every aspect has all the elements of a classic; religion, utter human deprivation, courage, love, mob insanity and above all hope; living hope against all conceivable odds. Hope that is the greatest hallmark of all true followers of Jesus. The story even has the modern day equivalents of royalty; powerful figures like Hillary Clinton, the secretary of State (USA), Monsignor Anthony Rufin, Archbishop of Islamabad, Syed Muhammad Abdul Khabir Azad, the imam of Badshahi mosque, governors, ministers and even the Pope. The top government officials of Pakistan, including the President and the prime minister, have always resorted to the rhetorical stance that the misuse of blasphemy laws shall not be allowed and that the government shall ensure that no one takes the law into their own hand… Reading Blasphemy leaves one wondering which country they live in or think they govern. It surely cannot be the Pakistan of the likes of Asia Bibi. Asia Bibi’s story has appeared in the newspapers and magazines of Pakistan in bits and pieces and has been superseded by other events since. The publicity it has received through the social media, electronic media and television screens has highlighted the plight of the human rights situation in Pakistan, especially in the context of its religious minorities. However, surpassing all these information sharing channels the book captures the timeline, the human drama, and the enduring threat that exists to the religious minorities of this nuclearly-armed nation. It is fast moving in pace, heart moving in content and absolutely a brilliant piece of writing.